Decorates any pointer to a simple object with a DataObject API using AutoPointer semantics. 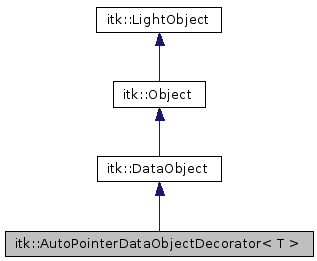 AutoPointerDataObjectDecorator decorates a pointer to an object with a DataObject API. This allows a pointer to an object to be encapsulated in a DataObject and passed through the pipeline. This object differs from SimpleDataObjectDecorator in that the decorator takes control of deleting the pointer upon destruction. The decorator provides two methods Set() and Get() to access the decorated object (referred internally as the component). Note that when an instance of SimpleDataObjectDecorator is created, the component is initialized with its default constructor (i.e. a null pointer). Definition at line 53 of file itkAutoPointerDataObjectDecorator.h. Definition at line 64 of file itkAutoPointerDataObjectDecorator.h. Definition at line 63 of file itkAutoPointerDataObjectDecorator.h. Definition at line 60 of file itkAutoPointerDataObjectDecorator.h. Definition at line 59 of file itkAutoPointerDataObjectDecorator.h. Definition at line 57 of file itkAutoPointerDataObjectDecorator.h. Definition at line 58 of file itkAutoPointerDataObjectDecorator.h. Copy information from the specified data set. This method is part of the pipeline execution model. By default, a ProcessObject will copy meta-data from the first input to all of its outputs. See ProcessObject::GenerateOutputInformation(). Each subclass of DataObject is responsible for being able to copy whatever meta-data it needs from from another DataObject. The default implementation of this method is empty. If a subclass overrides this method, it should always call its superclass' version. Reimplemented in itk::ImageAdaptor< TImage, TAccessor >, itk::ImageBase< VImageDimension >, itk::Mesh< TPixelType, VDimension, TMeshTraits >, itk::PointSet< TPixelType, VDimension, TMeshTraits >, itk::SimplexMesh< TPixelType, VDimension, TMeshTraits >, itk::QuadEdgeMesh< TPixel, VDimension, TTraits >, itk::EllipseSpatialObject< TDimension >, itk::SpatialObject< TDimension >, itk::TubeSpatialObject< TDimension, TTubePointType >, itk::ImageAdaptor< TImage, itk::Accessor::AsinPixelAccessor< TImage::PixelType, TOutputPixelType > >, itk::ImageAdaptor< TImage, itk::Accessor::AbsPixelAccessor< TImage::PixelType, TOutputPixelType > >, itk::ImageAdaptor< TImage, itk::Accessor::LogPixelAccessor< TImage::PixelType, TOutputPixelType > >, itk::ImageAdaptor< TImage, itk::Accessor::ComplexToPhasePixelAccessor< TImage::PixelType, TOutputPixelType > >, itk::ImageAdaptor< TImage, itk::Accessor::Log10PixelAccessor< TImage::PixelType, TOutputPixelType > >, itk::ImageAdaptor< TImage, itk::Accessor::ExpPixelAccessor< TImage::PixelType, TOutputPixelType > >, itk::ImageAdaptor< TImage, itk::Accessor::AddPixelAccessor< TImage::PixelType > >, itk::ImageAdaptor< itk::VectorImage< TPixelType, Dimension >, itk::Accessor::VectorImageToImagePixelAccessor< TPixelType > >, itk::ImageAdaptor< TImage, itk::Accessor::RGBToVectorPixelAccessor< TImage::PixelType::ComponentType > >, itk::ImageAdaptor< TImage, itk::PixelAccessor< TInternalType, TExternalType > >, itk::ImageAdaptor< TImage, itk::Accessor::SqrtPixelAccessor< TImage::PixelType, TOutputPixelType > >, itk::ImageAdaptor< TImage, itk::Accessor::AcosPixelAccessor< TImage::PixelType, TOutputPixelType > >, itk::ImageAdaptor< TImage, itk::Accessor::ComplexToModulusPixelAccessor< TImage::PixelType, TOutputPixelType > >, itk::ImageAdaptor< TImage, itk::Accessor::ExpNegativePixelAccessor< TImage::PixelType, TOutputPixelType > >, itk::ImageAdaptor< TImage, itk::Accessor::VectorToRGBPixelAccessor< TImage::PixelType::ValueType > >, itk::ImageAdaptor< TImage, itk::Accessor::TanPixelAccessor< TImage::PixelType, TOutputPixelType > >, itk::ImageAdaptor< TImage, itk::Accessor::ComplexToRealPixelAccessor< TImage::PixelType, TOutputPixelType > >, itk::ImageAdaptor< TImage, itk::Accessor::RGBToLuminancePixelAccessor< TImage::PixelType, TOutputPixelType > >, itk::ImageAdaptor< TImage, itk::Accessor::AtanPixelAccessor< TImage::PixelType, TOutputPixelType > >, itk::ImageAdaptor< TImage, itk::Accessor::SinPixelAccessor< TImage::PixelType, TOutputPixelType > >, itk::ImageAdaptor< TImage, itk::Accessor::ComplexToImaginaryPixelAccessor< TImage::PixelType, TOutputPixelType > >, itk::ImageAdaptor< TImage, itk::Accessor::CosPixelAccessor< TImage::PixelType, TOutputPixelType > >, itk::ImageBase< ::itk::GetImageDimension< itk::VectorImage< TPixelType, Dimension > >::ImageDimension >, itk::ImageBase< ::itk::GetImageDimension< TImage >::ImageDimension >, itk::Mesh< TCoordType, 2, itk::DefaultDynamicMeshTraits< TCoordType, 2, 2, TCoordType > >, itk::Mesh< TPixel, VDimension, TTraits >, itk::PointSet< TCoordType, VDimension, itk::DefaultDynamicMeshTraits< TCoordType, 2, 2, TCoordType > >, itk::PointSet< TPixel, VDimension, TTraits >, itk::SpatialObject< 3 >, itk::SpatialObject< ::itk::GetMeshDimension< TMesh >::PointDimension >, itk::TubeSpatialObject< TDimension, itk::DTITubeSpatialObjectPoint< TDimension > >, and itk::TubeSpatialObject< TDimension, itk::VesselTubeSpatialObjectPoint< TDimension > >. Definition at line 439 of file itkDataObject.h. Definition at line 77 of file itkAutoPointerDataObjectDecorator.h. Definition at line 76 of file itkAutoPointerDataObjectDecorator.h. Method for grafting the content of one data object into another one. This method is intended to be overloaded by derived classes. Each one of them should use dynamic_casting in order to verify that the grafted object is actually of the same type as the class on which the Graft() method was invoked. Reimplemented in itk::Image< TPixel, VImageDimension >, itk::ImageAdaptor< TImage, TAccessor >, itk::ImageBase< VImageDimension >, itk::Mesh< TPixelType, VDimension, TMeshTraits >, itk::PointSet< TPixelType, VDimension, TMeshTraits >, itk::VectorImage< TPixel, VImageDimension >, itk::QuadEdgeMesh< TPixel, VDimension, TTraits >, itk::Image< itk::BloxCoreAtomPixel< NDimension >, TImageDimension >, itk::Image< TNode *, VImageDimension >, itk::Image< itk::BloxBoundaryProfilePixel< TImageDimension >, TImageDimension >, itk::Image< TBloxPixelType, TImageDimension >, itk::Image< itk::BloxBoundaryPointPixel< TImageDimension >, TImageDimension >, itk::ImageAdaptor< TImage, itk::Accessor::AsinPixelAccessor< TImage::PixelType, TOutputPixelType > >, itk::ImageAdaptor< TImage, itk::Accessor::AbsPixelAccessor< TImage::PixelType, TOutputPixelType > >, itk::ImageAdaptor< TImage, itk::Accessor::LogPixelAccessor< TImage::PixelType, TOutputPixelType > >, itk::ImageAdaptor< TImage, itk::Accessor::ComplexToPhasePixelAccessor< TImage::PixelType, TOutputPixelType > >, itk::ImageAdaptor< TImage, itk::Accessor::Log10PixelAccessor< TImage::PixelType, TOutputPixelType > >, itk::ImageAdaptor< TImage, itk::Accessor::ExpPixelAccessor< TImage::PixelType, TOutputPixelType > >, itk::ImageAdaptor< TImage, itk::Accessor::AddPixelAccessor< TImage::PixelType > >, itk::ImageAdaptor< itk::VectorImage< TPixelType, Dimension >, itk::Accessor::VectorImageToImagePixelAccessor< TPixelType > >, itk::ImageAdaptor< TImage, itk::Accessor::RGBToVectorPixelAccessor< TImage::PixelType::ComponentType > >, itk::ImageAdaptor< TImage, itk::PixelAccessor< TInternalType, TExternalType > >, itk::ImageAdaptor< TImage, itk::Accessor::SqrtPixelAccessor< TImage::PixelType, TOutputPixelType > >, itk::ImageAdaptor< TImage, itk::Accessor::AcosPixelAccessor< TImage::PixelType, TOutputPixelType > >, itk::ImageAdaptor< TImage, itk::Accessor::ComplexToModulusPixelAccessor< TImage::PixelType, TOutputPixelType > >, itk::ImageAdaptor< TImage, itk::Accessor::ExpNegativePixelAccessor< TImage::PixelType, TOutputPixelType > >, itk::ImageAdaptor< TImage, itk::Accessor::VectorToRGBPixelAccessor< TImage::PixelType::ValueType > >, itk::ImageAdaptor< TImage, itk::Accessor::TanPixelAccessor< TImage::PixelType, TOutputPixelType > >, itk::ImageAdaptor< TImage, itk::Accessor::ComplexToRealPixelAccessor< TImage::PixelType, TOutputPixelType > >, itk::ImageAdaptor< TImage, itk::Accessor::RGBToLuminancePixelAccessor< TImage::PixelType, TOutputPixelType > >, itk::ImageAdaptor< TImage, itk::Accessor::AtanPixelAccessor< TImage::PixelType, TOutputPixelType > >, itk::ImageAdaptor< TImage, itk::Accessor::SinPixelAccessor< TImage::PixelType, TOutputPixelType > >, itk::ImageAdaptor< TImage, itk::Accessor::ComplexToImaginaryPixelAccessor< TImage::PixelType, TOutputPixelType > >, itk::ImageAdaptor< TImage, itk::Accessor::CosPixelAccessor< TImage::PixelType, TOutputPixelType > >, itk::ImageBase< ::itk::GetImageDimension< itk::VectorImage< TPixelType, Dimension > >::ImageDimension >, itk::ImageBase< ::itk::GetImageDimension< TImage >::ImageDimension >, itk::Mesh< TCoordType, 2, itk::DefaultDynamicMeshTraits< TCoordType, 2, 2, TCoordType > >, itk::Mesh< TPixel, VDimension, TTraits >, itk::PointSet< TCoordType, VDimension, itk::DefaultDynamicMeshTraits< TCoordType, 2, 2, TCoordType > >, itk::PointSet< TPixel, VDimension, TTraits >, and itk::VectorImage< TPixelType, Dimension >. Definition at line 453 of file itkDataObject.h. Reimplemented in itk::watershed::SegmentTree< TScalarType >, itk::ChainCodePath< VDimension >, itk::FourierSeriesPath< VDimension >, itk::Image< TPixel, VImageDimension >, itk::ImageAdaptor< TImage, TAccessor >, itk::ImageBase< VImageDimension >, itk::Mesh< TPixelType, VDimension, TMeshTraits >, itk::OrthogonallyCorrected2DParametricPath, itk::PointSet< TPixelType, VDimension, TMeshTraits >, itk::PolyLineParametricPath< VDimension >, itk::SparseImage< TNode, VImageDimension >, itk::SpecialCoordinatesImage< TPixel, VImageDimension >, itk::VectorImage< TPixel, VImageDimension >, itk::Statistics::OneHiddenLayerBackPropagationNeuralNetwork< TMeasurementVector, TTargetVector >, itk::Statistics::RBFNetwork< TMeasurementVector, TTargetVector >, itk::Statistics::TwoHiddenLayerBackPropagationNeuralNetwork< TMeasurementVector, TTargetVector >, itk::QuadEdgeMesh< TPixel, VDimension, TTraits >, itk::ChainCodePath< 2 >, itk::Image< itk::BloxCoreAtomPixel< NDimension >, TImageDimension >, itk::Image< TNode *, VImageDimension >, itk::Image< itk::BloxBoundaryProfilePixel< TImageDimension >, TImageDimension >, itk::Image< TBloxPixelType, TImageDimension >, itk::Image< itk::BloxBoundaryPointPixel< TImageDimension >, TImageDimension >, itk::ImageAdaptor< TImage, itk::Accessor::AsinPixelAccessor< TImage::PixelType, TOutputPixelType > >, itk::ImageAdaptor< TImage, itk::Accessor::AbsPixelAccessor< TImage::PixelType, TOutputPixelType > >, itk::ImageAdaptor< TImage, itk::Accessor::LogPixelAccessor< TImage::PixelType, TOutputPixelType > >, itk::ImageAdaptor< TImage, itk::Accessor::ComplexToPhasePixelAccessor< TImage::PixelType, TOutputPixelType > >, itk::ImageAdaptor< TImage, itk::Accessor::Log10PixelAccessor< TImage::PixelType, TOutputPixelType > >, itk::ImageAdaptor< TImage, itk::Accessor::ExpPixelAccessor< TImage::PixelType, TOutputPixelType > >, itk::ImageAdaptor< TImage, itk::Accessor::AddPixelAccessor< TImage::PixelType > >, itk::ImageAdaptor< itk::VectorImage< TPixelType, Dimension >, itk::Accessor::VectorImageToImagePixelAccessor< TPixelType > >, itk::ImageAdaptor< TImage, itk::Accessor::RGBToVectorPixelAccessor< TImage::PixelType::ComponentType > >, itk::ImageAdaptor< TImage, itk::PixelAccessor< TInternalType, TExternalType > >, itk::ImageAdaptor< TImage, itk::Accessor::SqrtPixelAccessor< TImage::PixelType, TOutputPixelType > >, itk::ImageAdaptor< TImage, itk::Accessor::AcosPixelAccessor< TImage::PixelType, TOutputPixelType > >, itk::ImageAdaptor< TImage, itk::Accessor::ComplexToModulusPixelAccessor< TImage::PixelType, TOutputPixelType > >, itk::ImageAdaptor< TImage, itk::Accessor::ExpNegativePixelAccessor< TImage::PixelType, TOutputPixelType > >, itk::ImageAdaptor< TImage, itk::Accessor::VectorToRGBPixelAccessor< TImage::PixelType::ValueType > >, itk::ImageAdaptor< TImage, itk::Accessor::TanPixelAccessor< TImage::PixelType, TOutputPixelType > >, itk::ImageAdaptor< TImage, itk::Accessor::ComplexToRealPixelAccessor< TImage::PixelType, TOutputPixelType > >, itk::ImageAdaptor< TImage, itk::Accessor::RGBToLuminancePixelAccessor< TImage::PixelType, TOutputPixelType > >, itk::ImageAdaptor< TImage, itk::Accessor::AtanPixelAccessor< TImage::PixelType, TOutputPixelType > >, itk::ImageAdaptor< TImage, itk::Accessor::SinPixelAccessor< TImage::PixelType, TOutputPixelType > >, itk::ImageAdaptor< TImage, itk::Accessor::ComplexToImaginaryPixelAccessor< TImage::PixelType, TOutputPixelType > >, itk::ImageAdaptor< TImage, itk::Accessor::CosPixelAccessor< TImage::PixelType, TOutputPixelType > >, itk::ImageBase< ::itk::GetImageDimension< itk::VectorImage< TPixelType, Dimension > >::ImageDimension >, itk::ImageBase< ::itk::GetImageDimension< TImage >::ImageDimension >, itk::Mesh< TCoordType, 2, itk::DefaultDynamicMeshTraits< TCoordType, 2, 2, TCoordType > >, itk::Mesh< TPixel, VDimension, TTraits >, itk::PointSet< TCoordType, VDimension, itk::DefaultDynamicMeshTraits< TCoordType, 2, 2, TCoordType > >, itk::PointSet< TPixel, VDimension, TTraits >, itk::SpecialCoordinatesImage< TPixel, 3 >, and itk::VectorImage< TPixelType, Dimension >. Reimplemented in itk::ImageAdaptor< TImage, TAccessor >, itk::ImageAdaptor< TImage, itk::Accessor::AsinPixelAccessor< TImage::PixelType, TOutputPixelType > >, itk::ImageAdaptor< TImage, itk::Accessor::AbsPixelAccessor< TImage::PixelType, TOutputPixelType > >, itk::ImageAdaptor< TImage, itk::Accessor::LogPixelAccessor< TImage::PixelType, TOutputPixelType > >, itk::ImageAdaptor< TImage, itk::Accessor::ComplexToPhasePixelAccessor< TImage::PixelType, TOutputPixelType > >, itk::ImageAdaptor< TImage, itk::Accessor::Log10PixelAccessor< TImage::PixelType, TOutputPixelType > >, itk::ImageAdaptor< TImage, itk::Accessor::ExpPixelAccessor< TImage::PixelType, TOutputPixelType > >, itk::ImageAdaptor< TImage, itk::Accessor::AddPixelAccessor< TImage::PixelType > >, itk::ImageAdaptor< itk::VectorImage< TPixelType, Dimension >, itk::Accessor::VectorImageToImagePixelAccessor< TPixelType > >, itk::ImageAdaptor< TImage, itk::Accessor::RGBToVectorPixelAccessor< TImage::PixelType::ComponentType > >, itk::ImageAdaptor< TImage, itk::PixelAccessor< TInternalType, TExternalType > >, itk::ImageAdaptor< TImage, itk::Accessor::SqrtPixelAccessor< TImage::PixelType, TOutputPixelType > >, itk::ImageAdaptor< TImage, itk::Accessor::AcosPixelAccessor< TImage::PixelType, TOutputPixelType > >, itk::ImageAdaptor< TImage, itk::Accessor::ComplexToModulusPixelAccessor< TImage::PixelType, TOutputPixelType > >, itk::ImageAdaptor< TImage, itk::Accessor::ExpNegativePixelAccessor< TImage::PixelType, TOutputPixelType > >, itk::ImageAdaptor< TImage, itk::Accessor::VectorToRGBPixelAccessor< TImage::PixelType::ValueType > >, itk::ImageAdaptor< TImage, itk::Accessor::TanPixelAccessor< TImage::PixelType, TOutputPixelType > >, itk::ImageAdaptor< TImage, itk::Accessor::ComplexToRealPixelAccessor< TImage::PixelType, TOutputPixelType > >, itk::ImageAdaptor< TImage, itk::Accessor::RGBToLuminancePixelAccessor< TImage::PixelType, TOutputPixelType > >, itk::ImageAdaptor< TImage, itk::Accessor::AtanPixelAccessor< TImage::PixelType, TOutputPixelType > >, itk::ImageAdaptor< TImage, itk::Accessor::SinPixelAccessor< TImage::PixelType, TOutputPixelType > >, itk::ImageAdaptor< TImage, itk::Accessor::ComplexToImaginaryPixelAccessor< TImage::PixelType, TOutputPixelType > >, and itk::ImageAdaptor< TImage, itk::Accessor::CosPixelAccessor< TImage::PixelType, TOutputPixelType > >. Reimplemented in itk::ImageBase< VImageDimension >, itk::PointSet< TPixelType, VDimension, TMeshTraits >, itk::QuadEdgeMesh< TPixel, VDimension, TTraits >, itk::SpatialObject< TDimension >, itk::ImageBase< ::itk::GetImageDimension< itk::VectorImage< TPixelType, Dimension > >::ImageDimension >, itk::ImageBase< ::itk::GetImageDimension< TImage >::ImageDimension >, itk::PointSet< TCoordType, VDimension, itk::DefaultDynamicMeshTraits< TCoordType, 2, 2, TCoordType > >, itk::PointSet< TPixel, VDimension, TTraits >, itk::SpatialObject< 3 >, and itk::SpatialObject< ::itk::GetMeshDimension< TMesh >::PointDimension >. Definition at line 413 of file itkDataObject.h. Set the requested region from this data object to match the requested region of the data object passed in as a parameter. For DataObject's that do not support Regions, this method does nothing. Subclasses of DataObject that do support Regions, provide an alternative implementation. Reimplemented in itk::ImageAdaptor< TImage, TAccessor >, itk::ImageBase< VImageDimension >, itk::PointSet< TPixelType, VDimension, TMeshTraits >, itk::SpatialObject< TDimension >, itk::ImageAdaptor< TImage, itk::Accessor::AsinPixelAccessor< TImage::PixelType, TOutputPixelType > >, itk::ImageAdaptor< TImage, itk::Accessor::AbsPixelAccessor< TImage::PixelType, TOutputPixelType > >, itk::ImageAdaptor< TImage, itk::Accessor::LogPixelAccessor< TImage::PixelType, TOutputPixelType > >, itk::ImageAdaptor< TImage, itk::Accessor::ComplexToPhasePixelAccessor< TImage::PixelType, TOutputPixelType > >, itk::ImageAdaptor< TImage, itk::Accessor::Log10PixelAccessor< TImage::PixelType, TOutputPixelType > >, itk::ImageAdaptor< TImage, itk::Accessor::ExpPixelAccessor< TImage::PixelType, TOutputPixelType > >, itk::ImageAdaptor< TImage, itk::Accessor::AddPixelAccessor< TImage::PixelType > >, itk::ImageAdaptor< itk::VectorImage< TPixelType, Dimension >, itk::Accessor::VectorImageToImagePixelAccessor< TPixelType > >, itk::ImageAdaptor< TImage, itk::Accessor::RGBToVectorPixelAccessor< TImage::PixelType::ComponentType > >, itk::ImageAdaptor< TImage, itk::PixelAccessor< TInternalType, TExternalType > >, itk::ImageAdaptor< TImage, itk::Accessor::SqrtPixelAccessor< TImage::PixelType, TOutputPixelType > >, itk::ImageAdaptor< TImage, itk::Accessor::AcosPixelAccessor< TImage::PixelType, TOutputPixelType > >, itk::ImageAdaptor< TImage, itk::Accessor::ComplexToModulusPixelAccessor< TImage::PixelType, TOutputPixelType > >, itk::ImageAdaptor< TImage, itk::Accessor::ExpNegativePixelAccessor< TImage::PixelType, TOutputPixelType > >, itk::ImageAdaptor< TImage, itk::Accessor::VectorToRGBPixelAccessor< TImage::PixelType::ValueType > >, itk::ImageAdaptor< TImage, itk::Accessor::TanPixelAccessor< TImage::PixelType, TOutputPixelType > >, itk::ImageAdaptor< TImage, itk::Accessor::ComplexToRealPixelAccessor< TImage::PixelType, TOutputPixelType > >, itk::ImageAdaptor< TImage, itk::Accessor::RGBToLuminancePixelAccessor< TImage::PixelType, TOutputPixelType > >, itk::ImageAdaptor< TImage, itk::Accessor::AtanPixelAccessor< TImage::PixelType, TOutputPixelType > >, itk::ImageAdaptor< TImage, itk::Accessor::SinPixelAccessor< TImage::PixelType, TOutputPixelType > >, itk::ImageAdaptor< TImage, itk::Accessor::ComplexToImaginaryPixelAccessor< TImage::PixelType, TOutputPixelType > >, itk::ImageAdaptor< TImage, itk::Accessor::CosPixelAccessor< TImage::PixelType, TOutputPixelType > >, itk::ImageBase< ::itk::GetImageDimension< itk::VectorImage< TPixelType, Dimension > >::ImageDimension >, itk::ImageBase< ::itk::GetImageDimension< TImage >::ImageDimension >, itk::PointSet< TCoordType, VDimension, itk::DefaultDynamicMeshTraits< TCoordType, 2, 2, TCoordType > >, itk::PointSet< TPixel, VDimension, TTraits >, itk::SpatialObject< 3 >, and itk::SpatialObject< ::itk::GetMeshDimension< TMesh >::PointDimension >. Definition at line 446 of file itkDataObject.h. Definition at line 402 of file itkDataObject.h. Provides opportunity for the data object to insure internal consistency before access. Also causes owning source/filter (if any) to update itself. The Update() method is composed of UpdateOutputInformation(), PropagateRequestedRegion(), and UpdateOutputData(). This method may call methods that throw an InvalidRequestedRegionError exception. This exception will leave the pipeline in an inconsistent state. You will need to call ResetPipeline() on the last ProcessObject in your pipeline in order to restore the pipeline to a state where you can call Update() again. Reimplemented in itk::ImageAdaptor< TImage, TAccessor >, itk::SpatialObject< TDimension >, itk::ImageAdaptor< TImage, itk::Accessor::AsinPixelAccessor< TImage::PixelType, TOutputPixelType > >, itk::ImageAdaptor< TImage, itk::Accessor::AbsPixelAccessor< TImage::PixelType, TOutputPixelType > >, itk::ImageAdaptor< TImage, itk::Accessor::LogPixelAccessor< TImage::PixelType, TOutputPixelType > >, itk::ImageAdaptor< TImage, itk::Accessor::ComplexToPhasePixelAccessor< TImage::PixelType, TOutputPixelType > >, itk::ImageAdaptor< TImage, itk::Accessor::Log10PixelAccessor< TImage::PixelType, TOutputPixelType > >, itk::ImageAdaptor< TImage, itk::Accessor::ExpPixelAccessor< TImage::PixelType, TOutputPixelType > >, itk::ImageAdaptor< TImage, itk::Accessor::AddPixelAccessor< TImage::PixelType > >, itk::ImageAdaptor< itk::VectorImage< TPixelType, Dimension >, itk::Accessor::VectorImageToImagePixelAccessor< TPixelType > >, itk::ImageAdaptor< TImage, itk::Accessor::RGBToVectorPixelAccessor< TImage::PixelType::ComponentType > >, itk::ImageAdaptor< TImage, itk::PixelAccessor< TInternalType, TExternalType > >, itk::ImageAdaptor< TImage, itk::Accessor::SqrtPixelAccessor< TImage::PixelType, TOutputPixelType > >, itk::ImageAdaptor< TImage, itk::Accessor::AcosPixelAccessor< TImage::PixelType, TOutputPixelType > >, itk::ImageAdaptor< TImage, itk::Accessor::ComplexToModulusPixelAccessor< TImage::PixelType, TOutputPixelType > >, itk::ImageAdaptor< TImage, itk::Accessor::ExpNegativePixelAccessor< TImage::PixelType, TOutputPixelType > >, itk::ImageAdaptor< TImage, itk::Accessor::VectorToRGBPixelAccessor< TImage::PixelType::ValueType > >, itk::ImageAdaptor< TImage, itk::Accessor::TanPixelAccessor< TImage::PixelType, TOutputPixelType > >, itk::ImageAdaptor< TImage, itk::Accessor::ComplexToRealPixelAccessor< TImage::PixelType, TOutputPixelType > >, itk::ImageAdaptor< TImage, itk::Accessor::RGBToLuminancePixelAccessor< TImage::PixelType, TOutputPixelType > >, itk::ImageAdaptor< TImage, itk::Accessor::AtanPixelAccessor< TImage::PixelType, TOutputPixelType > >, itk::ImageAdaptor< TImage, itk::Accessor::SinPixelAccessor< TImage::PixelType, TOutputPixelType > >, itk::ImageAdaptor< TImage, itk::Accessor::ComplexToImaginaryPixelAccessor< TImage::PixelType, TOutputPixelType > >, itk::ImageAdaptor< TImage, itk::Accessor::CosPixelAccessor< TImage::PixelType, TOutputPixelType > >, itk::SpatialObject< 3 >, and itk::SpatialObject< ::itk::GetMeshDimension< TMesh >::PointDimension >. Update the information for this DataObject so that it can be used as an output of a ProcessObject. This method is used in the pipeline mechanism to propagate information and initialize the meta data associated with a DataObject. Any implementation of this method in a derived class is assumed to call its source's ProcessObject::UpdateOutputInformation() which determines modified times, LargestPossibleRegions, and any extra meta data like spacing, origin, etc. Default implementation simply call's it's source's UpdateOutputInformation(). Verify that the RequestedRegion is within the LargestPossibleRegion. If the RequestedRegion is not within the LargestPossibleRegion, then the filter cannot possibly satisfy the request. This method returns true if the request can be satisfied (even if it will be necessary to process the entire LargestPossibleRegion) and returns false otherwise. This method is used by PropagateRequestedRegion(). PropagateRequestedRegion() throws a InvalidRequestedRegionError exception if the requested region is not within the LargestPossibleRegion. Default implementation simply returns true in order to support DataObjects that do not need regions (for instance itk::EquivalencyTable). Definition at line 428 of file itkDataObject.h.